Bounce messages are part of the email marketing world. Many times the reasons are beyond control and other times your emails or lists are to be blamed. This is one of the golden principles of email marketing that must be followed in all cases, bounce rates should be as low as possible. This kind of email reaches the recipient’s mail server but it is sent back before reaching their inbox. This usually occurs because of temporary issues like mailbox space unavailability, server not responding, the large size of email or spam filters blocking it. This is the result of a permanent issue like an invalid email address or sender’s IP address being blocked. This is the risky bounce that must be avoided because it can eventually cause your campaign to be rendered as spam. Here are some reasons of high bounce rates you must be aware of. This is one of the most common causes of emails being bounced. An old list is the one containing a considerably large amount of stale email addresses. Email addresses that have not been mailed in six months qualify as stale. Such email addresses cause your emails to bounce back and hence increase the bounce rate. In some cases, your emails might bounce back because you used a free email service like Gmail, Hotmail or Yahoo. 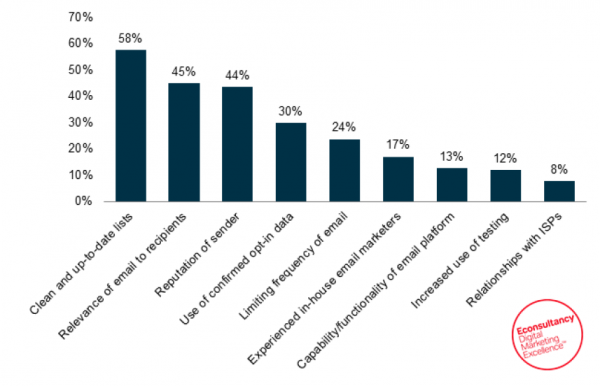 Many email providers have altered their DMARC policies to stop marketing emails from free email services. In contrast, email addresses with the private domain are less likely to bounce. Here is an article that lists some traits that your email service provider should have. If your list contains bogus and invalid email addresses, your bounce rate will automatically hike because your emails will never make it to the inbox because the inbox does not even exist. This is generally the result of getting a list from untrusted vendors and this is quite common than you think. How to clean your list? One of the best solution to keeping your bounce rate low is cleaning your list. Whether you purchased it or build it yourself, it will require cleaning to drop the bounce rate and increase the delivery rate. There is a very real chance that your list may have many misspelled email addresses. You must correct these obvious spelling mistakes and keep your list authentic. There can be spelling mistakes in the domain of the email. Any other obvious spelling mistakes in the name should be corrected too. For example, if there is an email like mary@hotmail.comm, correct it to marry@hotmail.com. 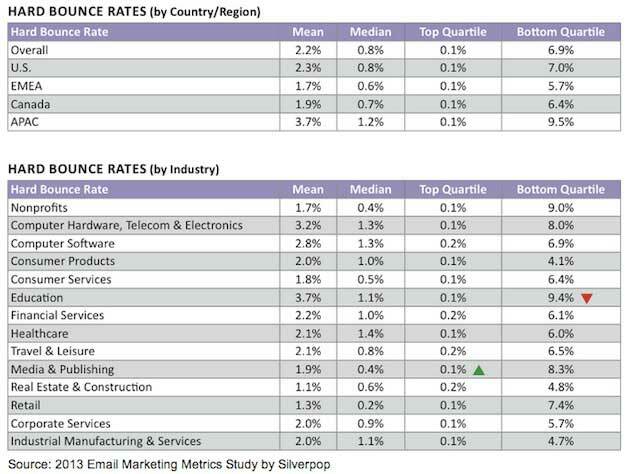 Misspelled email addresses can cause bounce rates to rise because the email does not exist. So checking the spellings can be beneficial. Some recipients might report your messages as spam even if you did acquire permission from them. Such email addresses should be removed from the list. ISPs will consider spam reports as negative for your reputation. Most ISPs will notify you when someone reports your email as spam so you get to know the recipient’s email. Removing this email will keep your emails from bouncing and hence keep the bounce rate under control. ISPs also keep a check on your recipient’s engagement with your emails. If they are not opening your emails, or reading your emails or moving them or replying to them, then that can hurt your sender reputation. Sender reputation can cause your emails to be classified as spam and eventually bouncing back. You can analyze your reports to measure the engagement of the recipients. You can check the last date a user opened your email. If a user opened your email months ago, then you should probably stop sending them emails anymore. But before you do that, you can try enticing them back with some kind of reward. However, if you do not find luck in engaging them again it is better to get rid of their email addresses. Remember that quality is more important than quantity in controlling bounce rates. According to Exact Target, 70% of people say they always open emails from their favorite companies. You can also actively email your list to measure their engagement and keep them interested. How Often Should I Email My List? Some email addresses are dedicated to some specific functions. For example, an email address complaints@abc.com is kept for receiving complaints within an organization. They will not be interested in receiving marketing emails on this address. This will likely cause someone to report you and as discussed before it can cause trouble. Similarly, generic email addresses like info@abc.com should be removed too. These addresses will not respond or engage or may even report you as spam. Such email addresses are kept for general purposes within an organization and are usually used to send out emails, not engage with other emails. A list with a lot of such address will likely see a high bounce rate and you will face the threat of being blocked or blacklisted. Besides bringing your bounce rate down, cleaning your list actively can have many other benefits as well. Even if your bounce rate is normal, it is important to clean your website to ensure that the bounce rate, as well as the delivery rate, are maintained. High bounce rate is simply disastrous for your email marketing campaign and should be kept low at all costs. The problem should be addressed in the beginning of your campaign in order to avoid getting the bounce rate high. Even if you have gotten the rate higher than normal, cleaning your list is the best solution. It is the ultimate way to ensure your list contains only potential clients and active subscribers.